I USED TO ENJOY FOOTBALL ON SUNDAY AFTERNOON – A RESPITE FROM THE POLITICAL COMMENTARY THAT PERMEATES THE NEWS THESE DAYS! On Sunday afternoons in the fall I used to enjoy watching professional football games, especially the Bear and Packer games. It was time to escape the reality of our everyday lives, and watch something that was meaningless in the overall picture of life. Now that has changed. The players want to make political statements on Sunday afternoons. The fans pay an exorbitant amount for tickets while many of the players are paid millions of dollars a year. 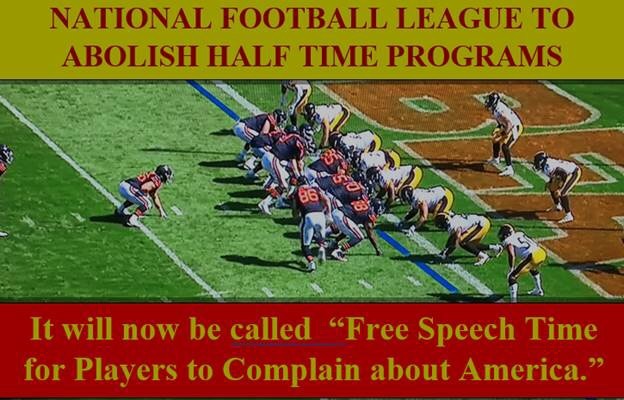 I for one do not want to pay the players on Sunday afternoon to punish me with their political views. Enough is enough. The Bears will be playing the Packers on Thursday night. I guess I will just skip the game. Frankly, I don’t like players who spit in the face of those who have served, and are serving this country. Maybe I’m out of touch with the values of the American people, but at least they won’t get my money any longer. This entry was posted in Uncategorized on September 26, 2017 by Good Day Illinois.